From our family to you, bienvenue! From the first vine planting in 1998, our family’s single estate vineyard has grown into a renowned multi-generational boutique producer of French-style wines. Home of Winestate Magazine’s Australian Wine of the Year for 2018, we are located on the hills above the historic village of Rylstone, an area we were drawn to for its similarity to the Burgundian terroir of our heritage. We’d love to share a slice of our beautiful hideaway with you, so why not visit our cellar door? The historic 1850s ‘Grafter Room’ is a beautiful converted sandstone stable with sweeping views of our vines – a special place to sit back, enjoy the wine and soak up vineyard life. We believe great wine is made in the vineyard, and it all starts with terroir. Our exceptional terroir is the closest comparable in Australia to Burgundy & Champagne in France. Our limestone enriched soils and ultra-cool climate enable cultivation of outstanding grapes. Our enduring drive for quality is supported by our focus on terroir-driven cultivation & wine making; and precision viticulture and sustainability. 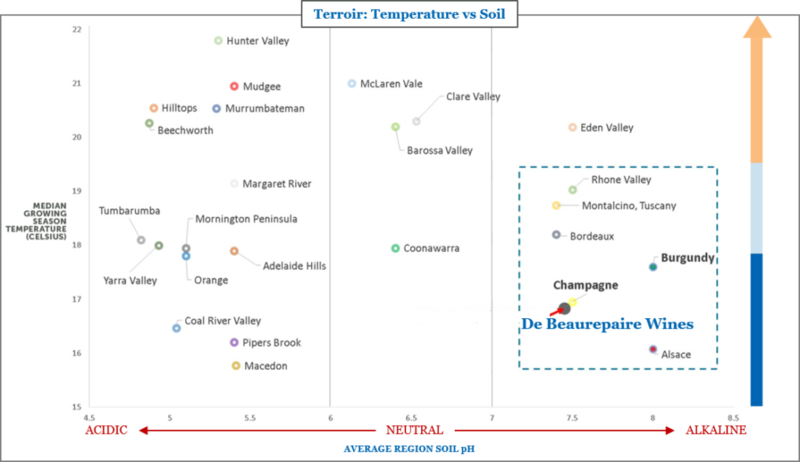 This chart demonstrates the similarity of our terroir to major French regions, and our uniqueness in Australia. We’d like to invite you to join our wine club. Our members enjoy a discount and the opportunity to select their own wines & when they would like to receive them, giving them the flexibility to choose only the wines they would like to drink and receive them on a delivery schedule that best meets their needs.